Pin It I watched a movie with the family last night. It was the perfect night for it. Cold and wet - the ultimate snuggle up weather. The movie we watched was We Bought a Zoo. The kids had seen it but I'm a little slow of the mark and hadn't yet had the pleasure and I can honestly say this movie has changed me. It's your standard kind of family feel good movie, the acting is great, but I don't think they would have won any Oscars for their efforts. The storyline is emotive and grabs you, yet it is somewhat predictable. But it wasn't the actors or the scenery or even the storyline really that hooked me in. It was the message or at least one particular message in the movie. My God did those words jump out at me, belted me in the stomach and left me momentarily breathless. You know those moments where everything spins through your head, words, images and dreams flash around and your mind is both confused and clearer than it ever has been all at once? Yep that! As Carl carried our sleeping kids up to their beds I sat there on the couch completely lost in thought. 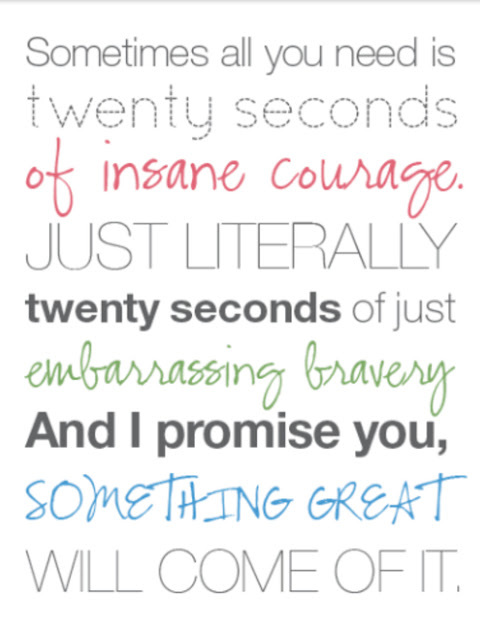 How many moments of insane courage have I had in my life and what great things came of them? There was the time when I was a little girl of 6 or 7 and fresh out of plaster from yet another operation. It was the school athletics carnival and I lined up with all the 10 -12 year olds to run an 800 metre race. Now I am not a runner, in fact I would be pushing it if I had to have to run to save my life and it was certainly no different back then. But for some reason I wanted to run this race. I came last, dead last. In fact I was still finishing my first lap as the rest of the runners were making their way to the finish line. I can clearly remember asking myself "do I give up, or do I go on"? I chose the latter and as I finally made my way to the finish line the whole school, all the teachers, the kids and the parents including my mum with the proudest tears in her eyes, all stood up and cheered me on for the last 50 metres. In hindsight I realise it took less than 20 seconds of insane courage to make a decision that would become a pivotal moment in my life. A moment that would always come to the front of my mind when I am met with challenges or when fear renders me motionless. It is a memory that feeds me courage when I need it the most. As I got ready for bed last night, I thought of the times I have called on that memory to help me through times when I felt I just couldn't possibly take another step, another breath or that I was just too scared to go on. Like that one particular moment that occurred during the birth of my first son. I had been labouring for fourteen hours and I was delirious with pain, fear, exhaustion and sleep deprivation. I honestly felt that I just couldn't keep going. My husband held my hand, looked into my eyes and whispered encouragement to me and it took no more 20 seconds and all remaining strength to push like my life and my child's life depended on it. Great things did happen that night. Our family was born. A few years later I found myself on the top of a glacier in New Zealand strapped to a complete stranger and about to jump off the edge.... or chicken out. It wasn't insane courage that got me up that mountain that day. It was just outright insanity. But it took less than 20 seconds to close my eyes, take what I hoped was not to be my last breath and run straight off the side of the mountain. When my eyes opened we were floating and I was completely free and euphoric and so full of an incredible greatness. Fast track a few more years and my second son was a few weeks into Kindergarten at school. He had been begging me to invite a little boy from his class for a play, but I felt so shy and uncomfortable approaching parents I had never met before. I wrote a note to them with an invitation to get together. I carried it with me for a few days as I just felt so awkward. It took only 20 seconds of insane courage to put that note in the little boys bag and today 3 years later that little boy is my son's best friend and his mother, well she is my bestie too. 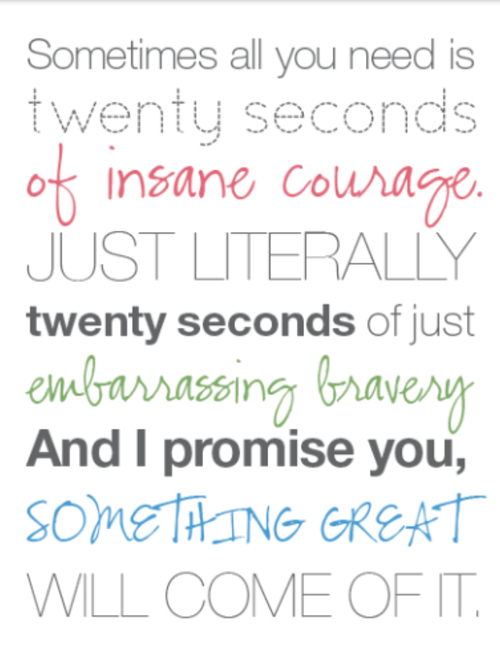 So many great things have happened when I think back, and just like they say so in the movie, its true - those great things took "only 20 seconds of insane courage, literally just 20 seconds of embarrassing bravery" and I have been changed forever by each of those occasions. Humour me and just quietly count out loud to 20. Its nothing is it? Not even a blip in time. Armed with this insight I am now ready to take more risks, to meet more challenges and to share that wealth of information with my own children. Never would I expect a family movie night would lead to such a life affirming realisation and empower me with something money just can't buy - courage to do great things. 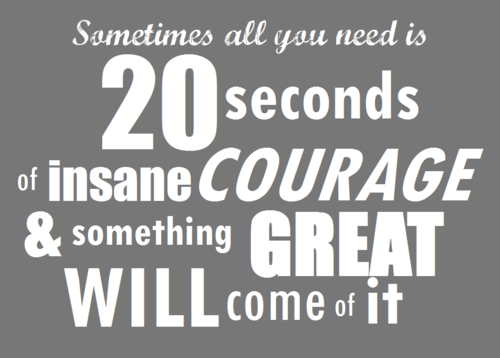 What great things in your life took just 20 seconds of insane courage? They are there, we all have those moments, it may just be that your eyes like mine have been closed for so long and you need to take a few minutes to look back through the memories in your mind and recall them. 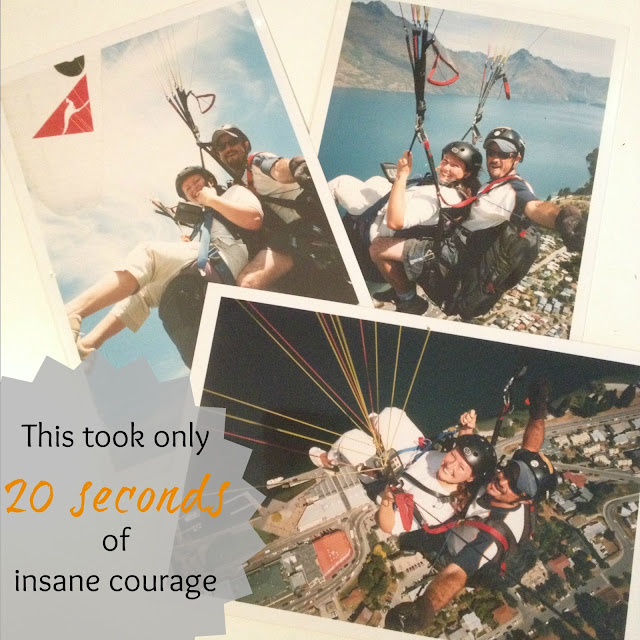 What would you like to do, what could you achieve that would only take 20 seconds, just a few breaths of completely insane courage?